I made the pilgrimage to Putney, Vermont yet again this year, basking in the crisp morning air, the fall foliage, the collegial feeling of a scullers-only event, the t-shirts, the egg rolls, the cheese sandwiches, the apple cider, and those incredible sugary cider doughnuts…. Let’s get one thing straight: I LOVE this race. I’ve been going to it since 1990, my first year of racing in a single. But there is something incredibly deceptive in all the quaintness. And believe me, this regatta has quaintness in spades. It was started by Peter and George Heller and is co-organized by Graeme King, the maker of the infamous King wooden racing shells (that I rowed for most of my rowing career, since I married an owner). A few years back, they sent an email to the previous year’s participants, inviting us all to the upcoming race. The email was classic. In the subject line, it said “Got Syrup?” (a take-off on the “Got Milk” ad campaign). When you opened the email, the first sentence said, “Wanna get some the HARD way?” You see, if you win, you get a large jug of Vermont maple syrup. Second place is a bag of apples. And third gets you a gallon of fresh apple cider. Again with the quaintness. 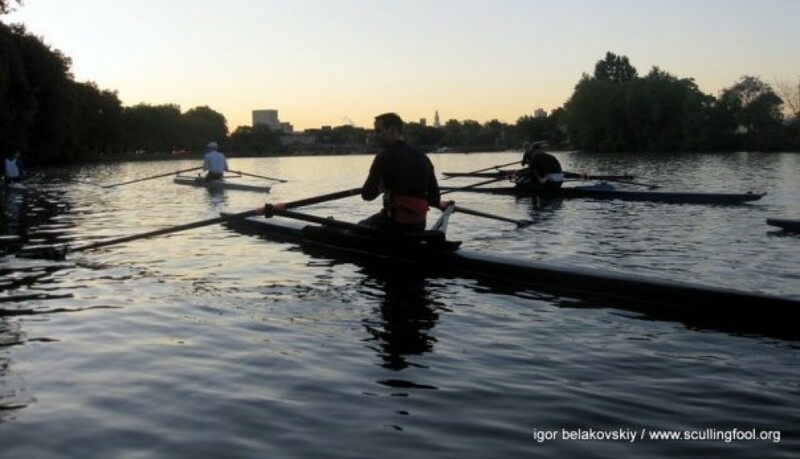 It’s worth reading the charming “history” on the regatta’s web site, www.rowgmh.com, which states: “The regatta attracts many elite scullers preparing for the other major head race on the Charles. Xeno Muller, Jamie Koven, and John Riley have all won the race, and the results sheet looks like a who’s-who of present and former national team members.” Yeah no kidding. You go up there thinking you’re going to have this lovely Fall rowing experience, paddling along blissfully in the gorgeous Vermont countryside. So while you’re thinking how quaint and lovely it all is, having warmed up in the foliage-filled downstream portion of the river, you start the race. And if you haven’t looked at the intimidating list of athletes in your event, you find out big-time during the race. It is TOUGH. You row upstream, against the current, for an agonizingly long mile and a half. Then you get to the turn, which consists of two large buoys. If you’re lucky, you don’t have rowers around you, but in any case, you’re exhausted at this point and you have to somehow turn this long, skinny unturnable boat 180 degrees. Then you head back downstream and are just wiped out as you approach the finish, which seems to take waayyyy longer than it should. One of the many years I rowed my ex’s King single (these boats are notoriously well built), I was trying to get up the steep steps carved into the dirt of the riverbank after my race. I was exhausted and weak, and I kept slamming the bow of the boat into the mud steps. On the third slam, I cried out, “Aaahhhh!!! My boat!! !” To which a bemused Graeme King, sitting on the grass enjoying the show, remarked, “I’m worried about those steps!” The boat was fine. The toughness of this race is a blessing and a curse. On the one hand, it prepares you for the Head of the Charles. The competition steels you for what’s to come in another three weeks (GMH is always held at the end of September). On the other – well maybe just for me – it seems like something always goes wrong. Last year, my rigging was messed up. The year before I scratched due to injury. The year before that, my rigging was messed up. Another year, in pouring rain, I had an incredible race, until about the final 200 meters, when I got a whole bunch of weeds tangled in my skeg. I pulled this anchor for the final 50 or so strokes, and it was NOT fun. I did have a miracle year, I think in 2001, in which I got either 3rd or 4th place. It was the best GMH I had ever had and was definitely the exception, not the rule. This year, I was determined to get revenge. I knew the course (or so I thought – it’s always tricky); my rigging was fine; I had been moving the boat pretty well in practice; and the weather turned out to be perfect, despite the threat of a hurricane. I had made reservations a year in advance at the Putney Inn, located right AT the race course, and my good buddy Pete Morelli bunked in with me (though the poor guy had to sleep in a cot). Everything was lining up perfectly. Good dinner at the Inn, good night’s sleep, and I woke up refreshed and ready. I plowed into the race, giving it my all, and was careful to stay close to shore because of the current (I’ve always had this theory that you want to be close to shore against the current, to reduce its slowing effect, and in the middle of the river, near the buoys, on the way back, to benefit from the current’s force). I caught both the guys who had started ahead of me by the turn, and the three of us rounded it all at the same time. I was sandwiched in the middle, and was grunting like Serena Williams with each stroke, but we all made the turn without incident. I had done well up to that point, but at a cost: I was exhausted. I managed to hold it together on the way back toward the start, staying close to the buoy. One of the guys who I caught was Trevor de Koekkoek, my Riverside friend and training competitor. We stayed with each other the whole way down the second half of the course, neck and neck. I was holding it together, barely, when I noticed the upstream launch site, where I had launched. My brain started playing mind games (sure John, blame your brain…). I thought, hmm, I launched from there, it wasn’t that far to the starting line, maybe I can start my sprint. Well, it’s about 600 meters from that point to the finish line. And I maybe had a 10 or 20-stroke sprint in me. So my dumbass brain started thinking “Hey, if you sprint, it will be over faster! !” I did a 30-stroke sprint, after which I was toast. I turned around and the finish line was at least 300 meters away. I was absolutely demoralized and completely spent. For the first time in my life, I stopped paddling in a race due to exhaustion. Trevor, who I had pulled away from in my sprint, passed me and said, “Come on, John!” Gotta love that – encouraging me as he gleefully put lots of water between our two boats. I managed to pick it back up and held a 28-29 until I reached the finish line. Man was I disappointed. I am certain I could have held the 26-27 rate pace I was going for a few more minutes, but noooooo!! I completely misjudged the distance and sprinted way too early. Oh well. That’s racing. As in life, we make mistakes, and we have to live with them. There is no coulda shoulda woulda. At the lunch afterwards, I saw that I had come in 6th place out of 34, which is not bad for me. But I was only five seconds off of Bob Eldridge and David Gray, long-time competitors of mine, who finished 4th and 5th, respectively. So of course I spent the afternoon thinking, “I could have been 4th! SIGH!!! !” But I’m reconciled myself with the result – after all, I still beat Trevor by eight seconds! The best part of the day was yet to come. Trevor and I were scheduled to race the double. We were both absolutely exhausted and hadn’t even rigged the boat yet. But we finally mustered the energy to go for it, after I stated I would be more than happy to scratch. We rigged as fast as we could, with help from a random rower (thank you whoever you were!) and paddled to the line just barely in time for the start. Our foot stretchers were mismatched, our shafts were not parallel, and we hadn’t rowed together in over a year. But we were both plenty warmed up and rowed a nice race, getting second place. Now that’s what I call redemption. See you next year, Putney, as I try once again to get some syrup – the hard way.